With just over two months to go until its release, Star Wars: The Last Jedi is almost upon us. The eagerly-anticipated eighth film of the epic sci-fi franchise premiered a teaser trailer back in April but impatient fans are finally being treated to a new full-length trailer which has landed online. Directed by Rian Johnson (Looper, Breaking Bad), the plot follows on from the events of The Force Awakens (2015) as young heroine Rey (Daisy Ridley) comes face-to- face with legendary Jedi knight Luke Skywalker (Mark Hamill). 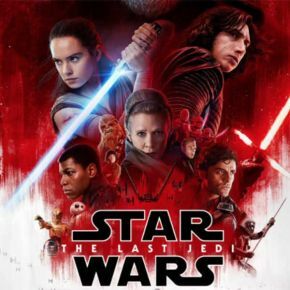 Whilst Rey undergoes training to become a Jedi, her companions Finn (John Boyega), Poe Dameron (Oscar Isaac) and General Leia Organa (Carrie Fisher) will find themselves preparing for another onslaught from the First Order which is led once again by the sinister yet troubled Kylo Ren (Adam Driver). The new action-packed footage shows Rey physically committing herself to her training and showcasing her powers. However this causes great concern for Luke who tells her that he has seen this “raw strength only once before” as a reference to his previous involvement with Kylo. Meanwhile Kylo finds himself torn as he ends up in a difficult position with his mother Leia while Finn and his former commander Captain Phasma (Gwendoline Christie) go toe-to- toe in a potentially epic showdown. Other original cast members back from The Force Awakens include Oscar Isaac (Poe Dameron), Lupita Nyong’o (Maz Kanata), Billie Lourd (Lieutenant Connix), Andy Serkis (Supreme Leader Snoke) and Domhnall Gleeson (General Hux). Despite her tragic death in December last year, the late Carrie Fisher will appear as Leia for the final time along with fellow franchise veterans Anthony Daniels (C-3PO) and Peter Mayhew who shares his beloved Chewbacca role with Joonas Suotamo. Furthermore, Oscar-winner Benicio Del Toro (Traffic, Guardians of the Galaxy), Laura Dern (Jurassic Park, Wild) and Kelly Marie Tran (About a Boy, Ladies Like Us) are the high-profile additions to the cast with all three set to play key roles in this outing. Star Wars: The Last Jedi will be released worldwide on December 15th.